This is such a little thing, but I have noticed that many customers don’t know where to stand at Starbucks. 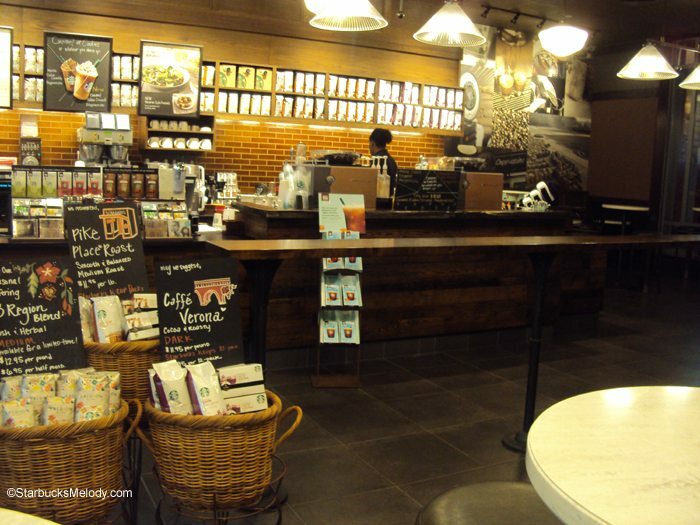 They’re not sure where to form a line to pay for their delicious hand-crafted beverages! Here’s a little secret – the overwhelming majority of Starbucks are designed so that customers line up along the pastry case. There are a few exceptions out there, but store design tries to navigate customers along the pastry /Ready-To-Drink (“RTD” – it holds the bottled beverages on its lower level) case, tempting customers to buy food, juice, and more. Now you know. Line up along the pastry case, pretty please. ^ That’s what not to do. There is a strong compulsion to line up like that. I will be honest. I didn’t realize that store design tries to line people up along the pastry case until a partner told me this. In 2009, the then-store manager of First and Pike (Leah) told me how the line was supposed to flow. I didn’t know until she told me! I think that it would make sense for Fourth and Union to have a tall, long, guiding table too. Please do not attempt to order from the espresso bar. I think I know why some people try and do this. (I have never seen this happen in downtown Seattle, but baristas have told me that it happens once in a blue moon). 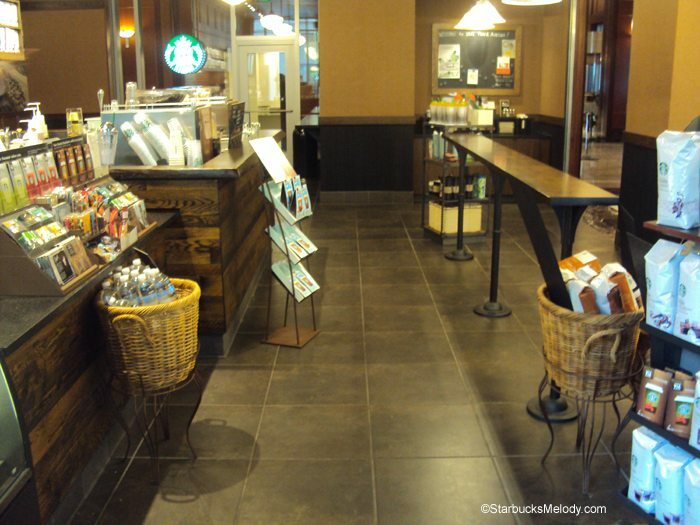 I would imagine that customers who attempt to order from the bar are very unfamiliar with Starbucks. I think perhaps they’re more familiar with something like a Subway or Taco Del Mar where you build your food item, and then at the end, you get to the register and pay for your taco or sandwich, including all the wonderful add ons, like guacamole, cheese, and such. Thanks for joining me in this lesson on where to form a line to order and pay for your beverage. If we line up correctly, it will make a little easier for partners to ‘call the line,’ if they decide to do that. Also, for many stores, if the line doesn’t form correctly, it will bunch up into the condiment bar area, causing confusion. There are exceptions! The Olive Way Starbucks in Seattle is not designed with the line along the pastry case! And, in any case, it will make it much easier to see all the new yummy La Boulange pastry items (or the pastry items that your store has) when they’re available. One of the best ways for us to be able to continue to provide the world class customer service we are known for is to be able to “call” the line, so while one person is ringing, another person is taking the orders for the other people in line. This is nearly impossible when the queue goes straight away from the register, as it causes a mess of confusion, but when people line up along the pastry case, it is super easy and effective, and very often results in your drink being ready as you pay. It’s funny because it’s true of most stores (look at a Barnes & Noble, or one of the new style Old Navy stores for prime examples of directed queues), but people seem to object to “impulse” items more when they are food items. In my store, we have the bar like in your first picture example, and we still have to actively work at times to maintain a line that’s easy to call. Unfortunately my store doesn’t have a permanent physical barrier to prevent customers from lining up directly in front of registers, so we remedy this by placing baskets and cube displays there instead. Interesting post! I have not seen any of those long tables like you show here in any store in this area, altho it seems clear, in most stores, that a customer needs to wait to order along the pastries. However, I’ve seen quite a few stores here where that’s almost impossible…. it would push people back into the area leading to the back of the store…there’s just not enough room in these ‘designs’. However, I have also never seen anyone try to order from the pick-up area at the bar. Mostly I see, when there are long lines and in these badly designed stores (with lots of wasted space), customers just lining up out the door…..but, that’s really the only option in these cases. I remember years ago (in the 80’s) when a Sears store that I had to walk thru to get inside a small mall, was re-designed. They made it so a person had to pass SO many things just to navigate thru the store that it became a real pain just to be in there…but, I was told, that was the intent. It didn’t work for me and I just avoided the store. Easier said than done. Our local store (Reedley, CA 93654) has recently tried to re-educate coffee-lovers about how to line up, but mostly to no avail. I think that people don’t feel like they are protecting their spot in line from the less informed unless they are right behind R1. Unfortunately in our store our pastry case is in the back of house. It makes it rather interesting to guide people to our offerings. If we are really busy we just get a line out the door and the only way people see our case is if they are verbally offered a pastry. Which we offer anyway, but it isn’t the best layout. People very often try to order from the bar in my store (pioneer square), most due to unclarity when entering. If they go to the left they will get trapped at the bar and have to go all the way back around to get the the line. This usually only happens if there is no line or a small one in front of the register. So confusing! I occasionally have to wrangle the line into shape, mostly because my customer flow requires a tight u-turn to get back out. If people line up the wrong way, there’s no easy way out! That said, I’m a strong believer in the idea that “calling the line” is a fool’s game. It moves cups around but doesn’t move people faster. I know that’s almost a religious debate, but I’ve seen the light on this on! @GreyGhostX – I notice the practice of calling the line has just about completely stopped in Seattle. I assume that there was some official decree on it, at some point. Personally, I am not a huge fan of it. I don’t really want to be asked twice for my drink, and I am not usually in such a rush that a savings of thirty seconds or one minute makes a difference to me. 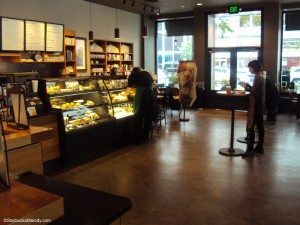 @Zac & Nicole – Speaking of Pioneer Square, that must’ve been a hold over from the days two lines at the stores – the “whole bean line” and the “beverage line.” I remember that well – I am sure that Oak Tree (#308), and Northgate (#358) both were designed originally to have two lines too. At Pioneer Square, I can see how that would happen, people trying to order from the bar. 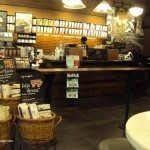 Besides, that area has such a mix of customers, some of whom who are tourists checking out P. Square, and could be new to Starbucks! Melody very nice post. I am in cambridge now and this issue of where to line up is timely because I have been to several stores in this area and the lines formed are varied for sure. My local SB that was just remodeled has that long skinny table to direct people. Btw not on topic but melody yesterday I was in the Harvard square SB and had this great convo with a partner named Colin that remembered meeting you! @Purple1 – I remember Colin! It’s a very small Starbucks world indeed! @Denise – Harlem and Lake has that long narrow table that is in the same exact spot. You probably missed it because it is camouflaged by all the displays and merchandise on the opposite side, before making the turn toward the display case. I am usually troubled by the lack of commonsense used by parents of young children, who wait in line. Whether they know where to stand or not?? Many just don’t pay attention. I have seen parents park a two and 3 seat baby carriage, behind customers waiting for drinks at the end of the bar. I have seen customers get called up to the bar to get a hot customized drink, as they turn around to walk away with their drink, I have seen parents slide the carriage into the path of these customers. I know it isn’t intentional, but I wish parents would remember to keep their kids, including toddlers and small children away from the bar. Thank God I haven’t seen it happen yet, but I have come pretty close to being tripped up with hot drinks by carriages and unsupervised children. Excellent call out Melody! I feel for those customers who are unsure of where and how the line forms. I love to try new places to eat and sometimes not knowing the protocol as regulars do can make me self-conscious. In my experience these are Starbucks customers more often than not but perhaps they are new to my store. I have also seen many a regular customer get behind the individual lining up incorrectly because they want to ensure their place in the line. But hey, if this is the worst thing that happens in our day then we are doing pretty well. Usually I will take the 10 seconds to step out and ask customers to line up along the case. I have found that to be less embarrassing and more friendly than shouting it from behind the counter. @Chgo: was that table thing there in January? I definitely don’t remember seeing it, and I was there for quite a while. ? I did take some pictures, I’ll have to go back and look at them…if I didn’t delete them. I’m really interested to hear about people against calling the line… in my area, people are super in favor of it. I’ve had plenty of times where I am the DTO, talking to a customer at the speakerbox on the headset while near the pastry case, and have had people try to “help” me call the line by telling me their order. My customers seem to like it, but I can also see why people wouldn’t. I also do make sure that I am the one to tell the register person what the order was though, so as not to make the customer have to repeat themselves. Maybe that makes a difference in the perception of it? It’s really interesting. I didn’t even realize there were differing opinions on it. We would call the line during large rushes (BOGO, Happy Hour, etc) and it greatly sped things up. We still do our cup markings by hand, and with properly marked cups with the customer’s name ringing up orders were a breeze. It also helped to reduce drink errors as the partner on the register would confirm the drink again with the customer before sending it down the line to the bar. @Denise – That’s a good question. I believe I visited the store before you had and can’t say for sure, but I believe it was put in during the remodel and not after. Of course I don’t remember it being there the whole time, but when I brought it up to my wife around March, she insisted I was crazy, blind and it was there. I know It would be fruitless to argue otherwise with a woman ;-), so it’s in my best interest to agree and say she right. We have a same, long table in our store since our remodel a year or so ago. Customers are baffled by it :-/ and I’m not sure why, but it seems that they think stepping behind it is stepping into the ‘no go zone’ – like stepping behind the counter would be off limits. Also, I myself am baffled at the number of customers that will go to the bar to order, or to some partner down at the other end of the counter making whipped creams and try to order. Why is it not obvious that you go to the cash register to place and pay for your order? I do not understand that kind of logic, or lack of it. @Patsy – The only logical thing that I can think of is that the ordering at the bar comes from customers who are really used to taco places or subway-type places where you build your food item, and pay at the end. I’m surprised the table in your area baffles people. I sometimes think we have really well-trained customers in Seattle! 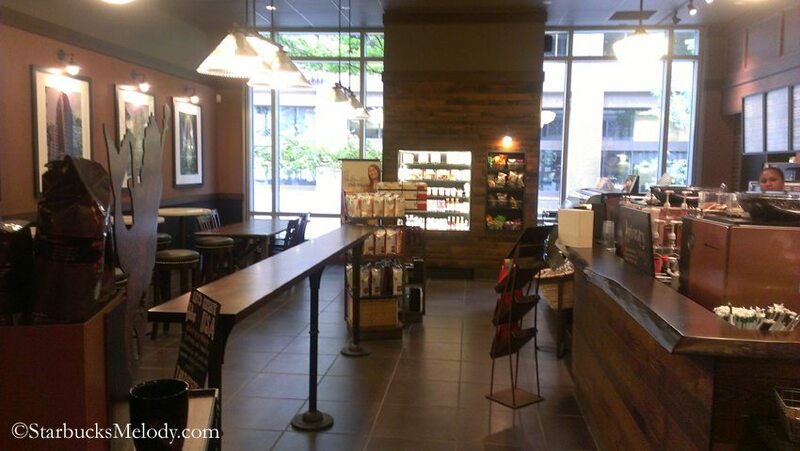 LOL I can honestly say I never thought of the long table creating a ‘no go’ zone, but now that you say that, I guess that could make sense for customers who are brand new to Starbucks. I really like that the long table is there and it helps direct people to the register along the food plane. I don’t really think this table is somewhere I would want to sit and drink my beverage though…it’s right in the middle of the action and I’d want to be off to the side. Oh gosh, when customers go the wrong way in our lines, it can be awffuull! Stanchion’s help but it can be hard to have them and not have it look cheap. I love the new built in ones we have at stores, that look more like a long ledge and 2 metal legs. It really helps direct traffic! Ha! Funny post, but oh so true. I’ve seen it many times where customers will form a line straight back to the condiment bar area, which is often found right by the front door…not a pleasant welcome for those customers walking into the store. 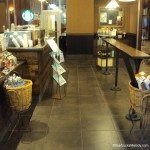 🙂 Most of the larger stores I’ve frequented seem to have either those tall tables or some other definitive barrier to designate where customers should line up. But the smaller stores? Not so much. I sense this is mostly written for Starbucks employees. But I found a link to this on Facebook, so here I am. Forgive my ignorance, but I have no idea what an RTD case is. Of course, I’ve never had trouble figuring out where to line up. It’s usually pretty obvious. @HT Katt – This article was pretty squarely directed at customers. I have seen customers glare at 3 people standing along the pastry case, and then try to form a separate line out from the register. 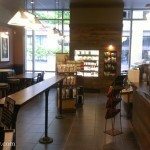 Thank you for your comment – I added clarification and wrote out “Ready-to-drink” – I realize that I’ve learned a whole food/beverage QSR (quick service restaurant) vocabulary from writing about Starbucks for years now. I genuinely hoped this article would persuade a few customers to line up along the pastry case. That was the main goal with this article. And secondarily, it helps when store design creates features to make this happen. @Melody – Thanks for the explanation.